If you are a graphic artist, regardless of the amount of experience you have obtained over the years, there will always be preferences that may include the type of file format that you want to work with or even the tool that you want to use for editing. The primary reason why preference matters is because it gives the designers enough freedom to choose the type of file format as well as the editing software, and the more they can get creative if they are comfortable with what they are working with. 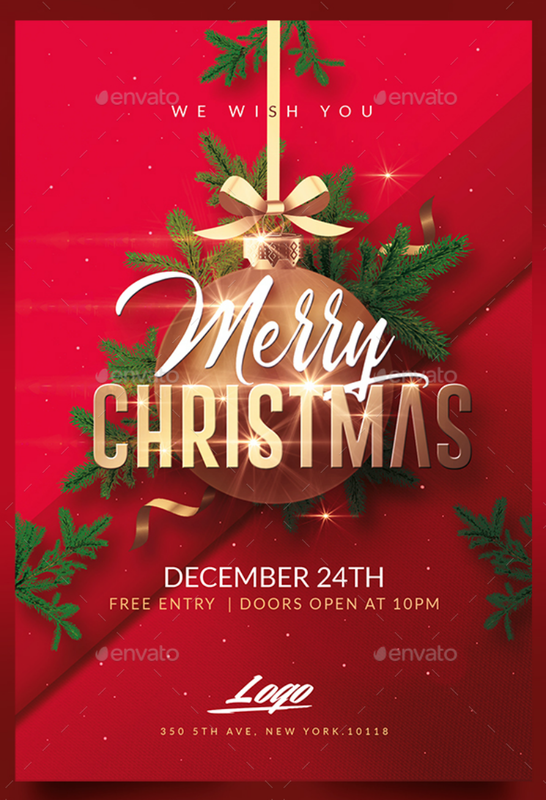 If you are more into the latter file format, then today is definitely your day since we have an entire collection of PSD invitation designs below just for you, go ahead and see them yourself. As mentioned earlier, there are graphic artists that are more into vector files while there are also those that prefer the simpler PSD files. Some may be more knowledgeable in the use of vectors and some may also be more comfortable with PSD, and some graphic artists may even prefer to use Adobe’s well-known Photoshop while others may go with an alternative such as CorelDRAW or even GIMP. Counting down the days to Christmas, here is a wonderful invitation design that is intended to be used for that particular holiday. The elements included on this invitation design are exactly what you would find during the Christmas season, such as fir leaves, the ribbons, and the Christmas ball. 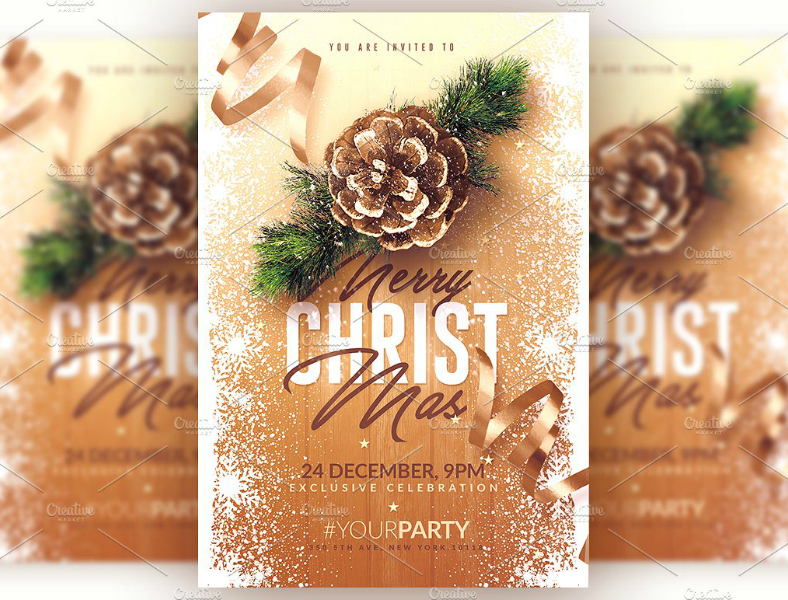 The background of this design is just as appropriate to the event as the other elements, and it also enhances the appearance of this Christmas invitation design. That said, why not download this design and use it for your Christmas invitations? Have you made your New Year’s resolution yet? Because it’s only a couple of weeks until 2017 ends and 2018 starts. Well, aside from just preparing a list of things that we need to do or change about ourselves (which may or may not be accomplished), shouldn’t we also have the need to prepare for a celebration appropriate for that event, because I believe the transition to the New Year deserves a fitting celebration. Why is that so? The primary reason is that a lot has happened over the year, and we should be thankful that we were able to make it through. 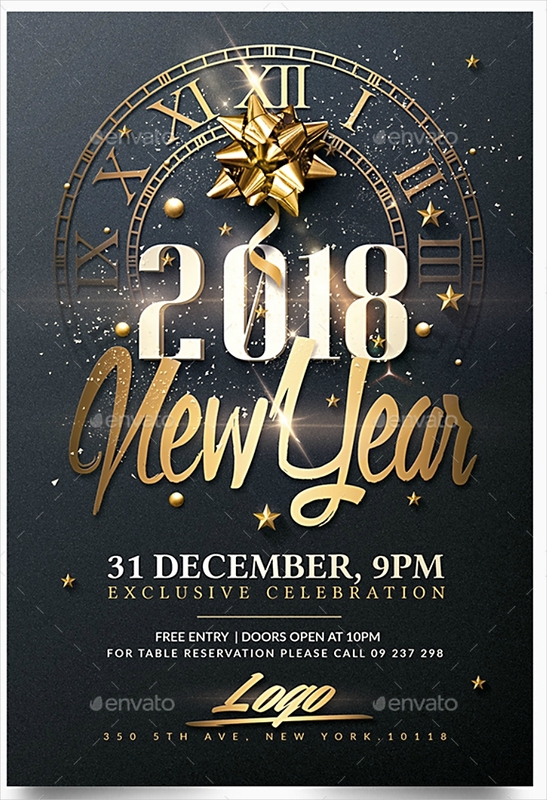 So if you think that was a sufficient reason and you’re planning on holding a New Year’s Eve celebration, check out the awesome party invitation design shown above. 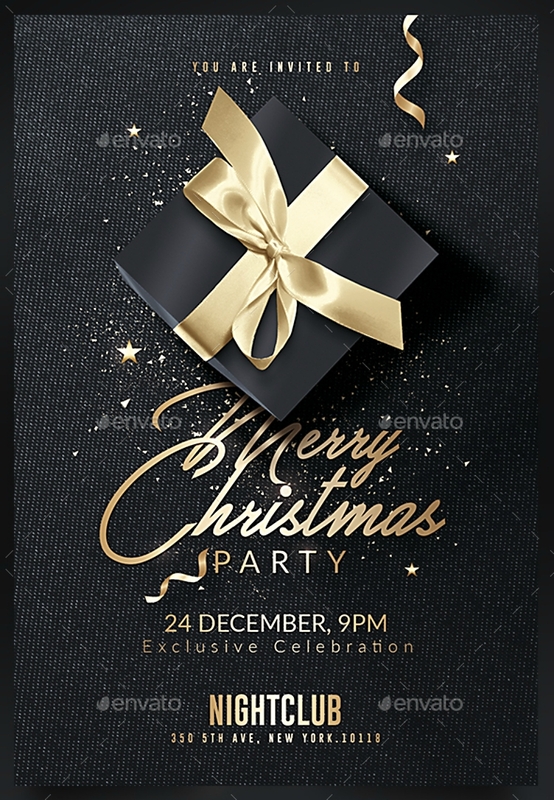 Here is another event invitation design that is intended for Christmas parties, but unlike the previous one that showed a lot of Christmas-themed elements, this one simply features a gift box wrapped in black and with a gold ribbon. 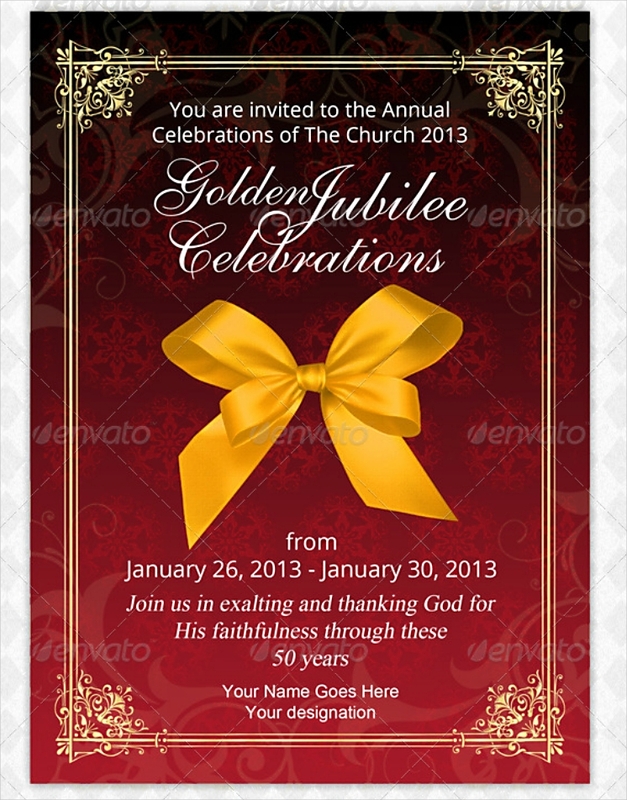 This is an ideal invitation design if you plan on making your party’s motif black and gold. 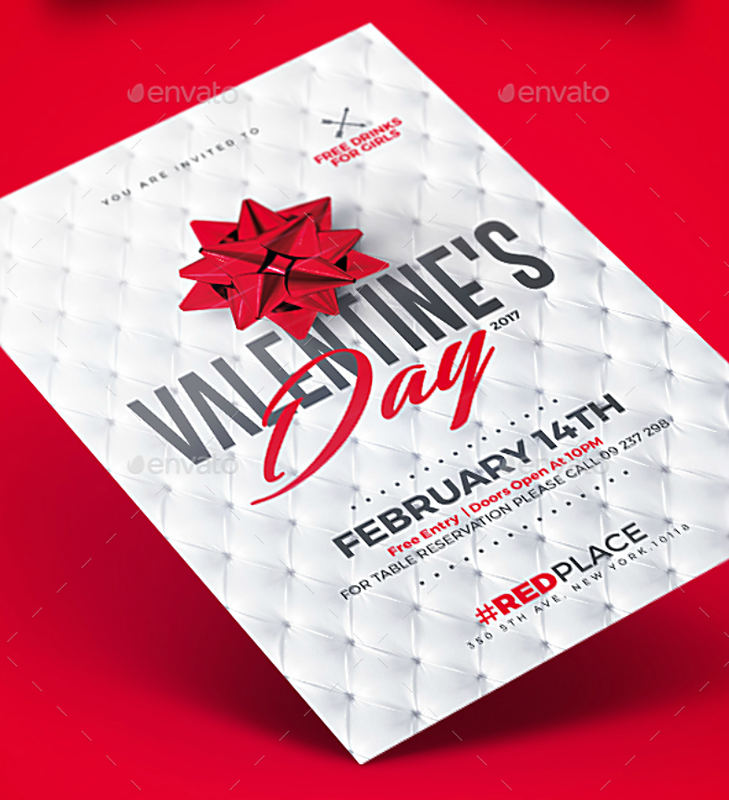 The background may be in black, but to keep the design from looking dull, it also contains a fine texture that adds to the overall quality of the design. While I would always say that “Why wait for Valentine’s Day to express our love for others when we can always do it on other regular days?” I also believe that we should go out of our usual ways during this particular day to make it even more special for our loved ones. 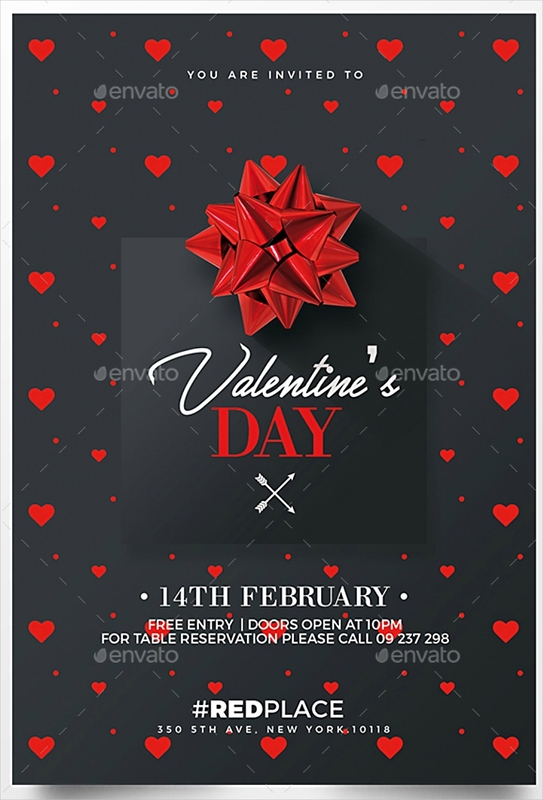 If you are planning on hosting a Valentine’s Day event for all the couples and lovers out there, make it special from the invitation to the celebration itself, and here is an appropriate event invitation design that may suit any theme or motif because of its simplicity. Weddings will always be a special celebration, not just for the couple being wedded but also for the people who are able to witness this life-changing event. Weddings happen only once in a lifetime for most couples, which is why they usually give it their all when planning for theirs. In relation to that, here is a wedding invitation design that may capture the interest from every couple, and it is because it features a floral border that is inspired by watercolor paintings. 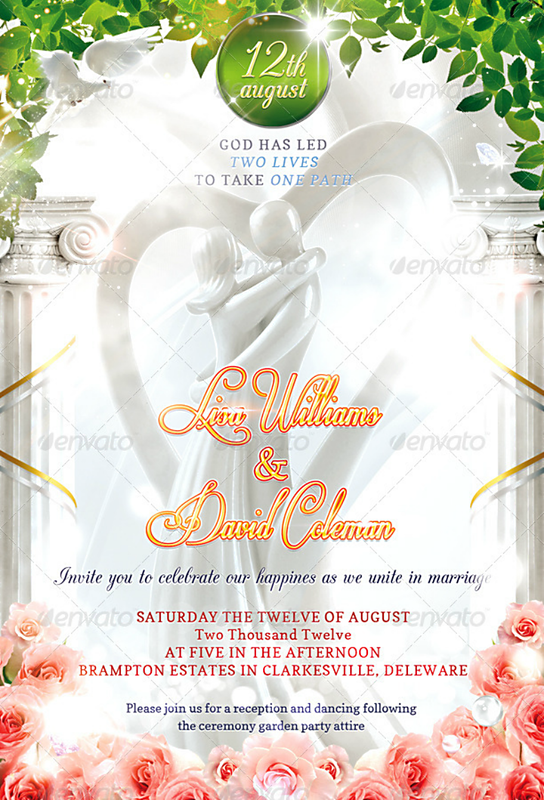 The entire middle area of the design is left clean to give emphasis to the names of the couple and the other necessary details about the wedding. 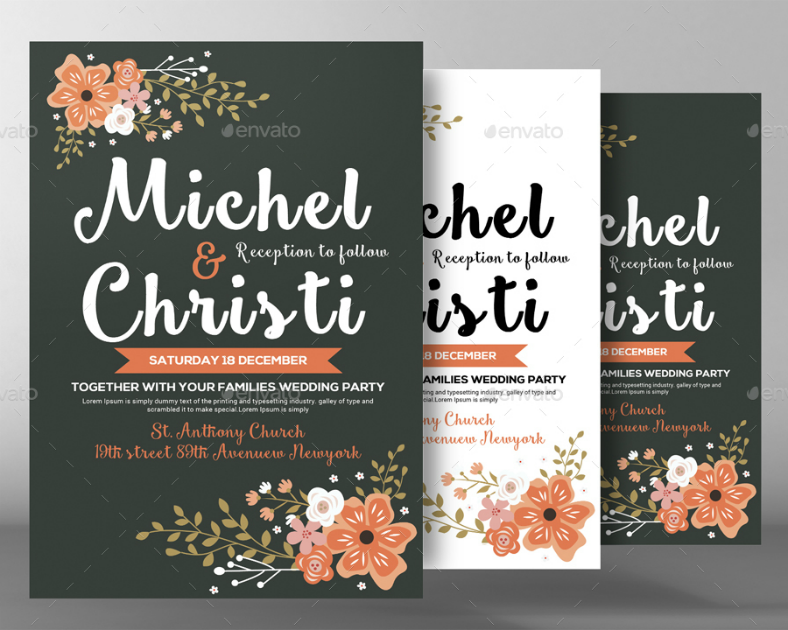 If you enjoy the floral elements of this design, then you may also enjoy looking at more floral wedding invitation designs. Here is another wedding invitation that features watercolor art, but unlike the previous one that only used it for the borders, this uses it for the entire backdrop of the invitation design. If you look closely at the watercolor-inspired backdrop, you may notice that it is actually a photo of the couple. When using this design, you may be able to change the hue for the background, but make sure to increase its brightness and slightly decrease its contrast to avoid its color from conflicting with the typography and the other foreground elements. 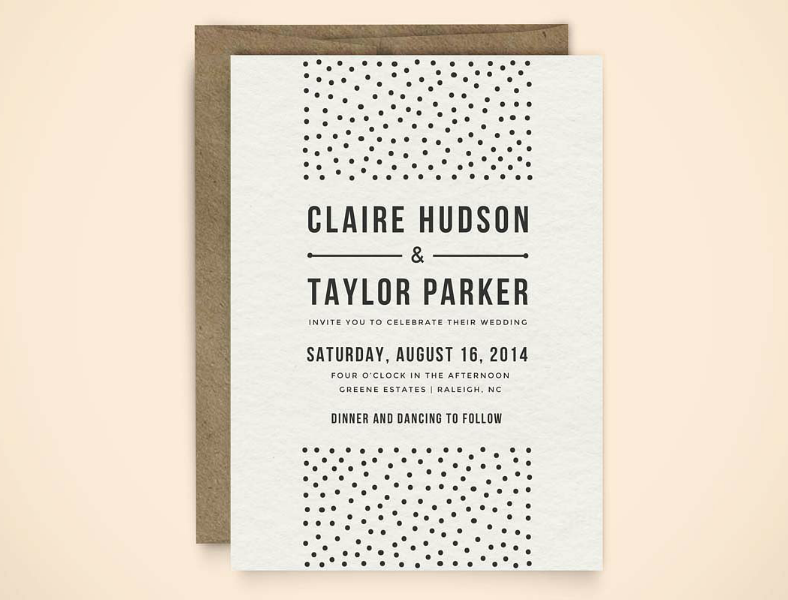 If you haven’t had enough of the wedding invitation designs to choose from, here’s another that you may want to consider using for the wedding that you are planning. For this design, it makes use of an orientation that is different from most of the designs that we have shown you in this collection. 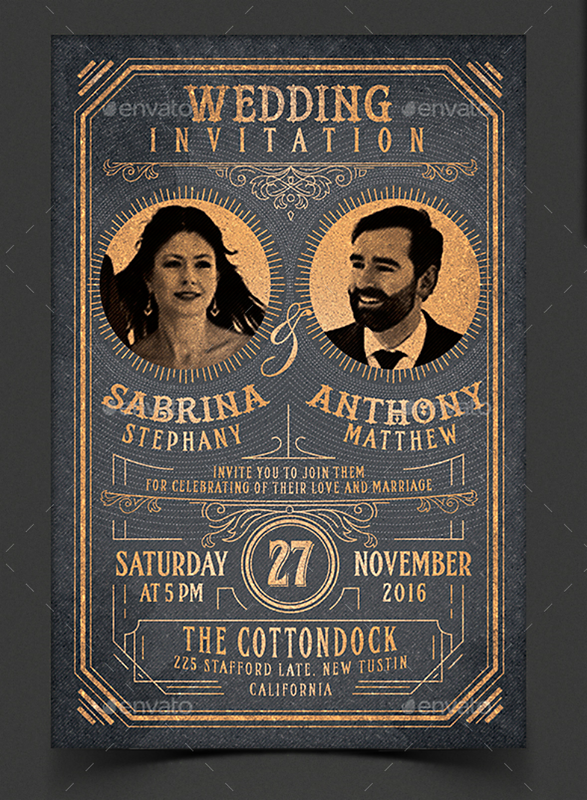 While most invitation designs here are in a portrait orientation, this one is in a landscape, which is perfect if you intend on writing long messages or simply arranging the typography in a horizontal fashion. 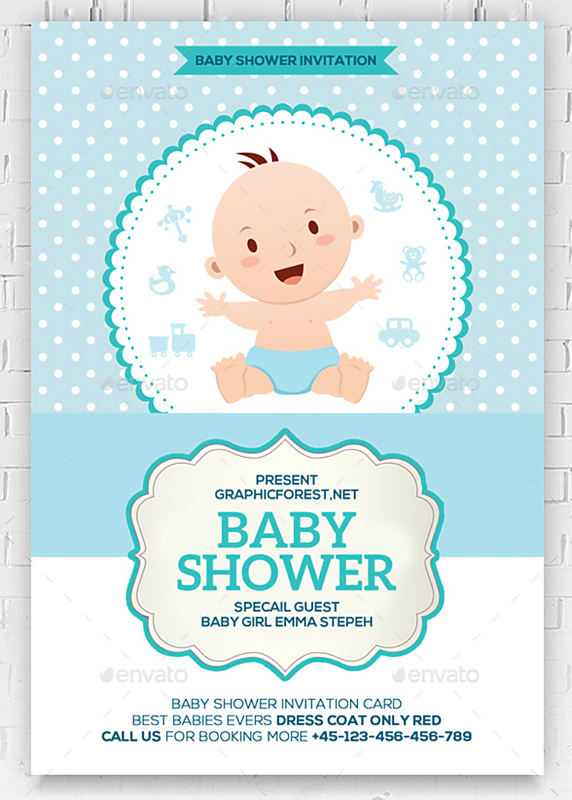 Now, for an invitation design intended to be used for baby showers. Here is one that you may be very interested in. What makes us certain that this design may capture your interests is its effective use of vibrant colors, which is very much appropriate for the occasion. Baby showers are indeed worth celebrating, especially for the mother-to-be, as she awaits the birth of her child. And using bright colors as a theme can help in setting up the positive mood for this wonderful event. 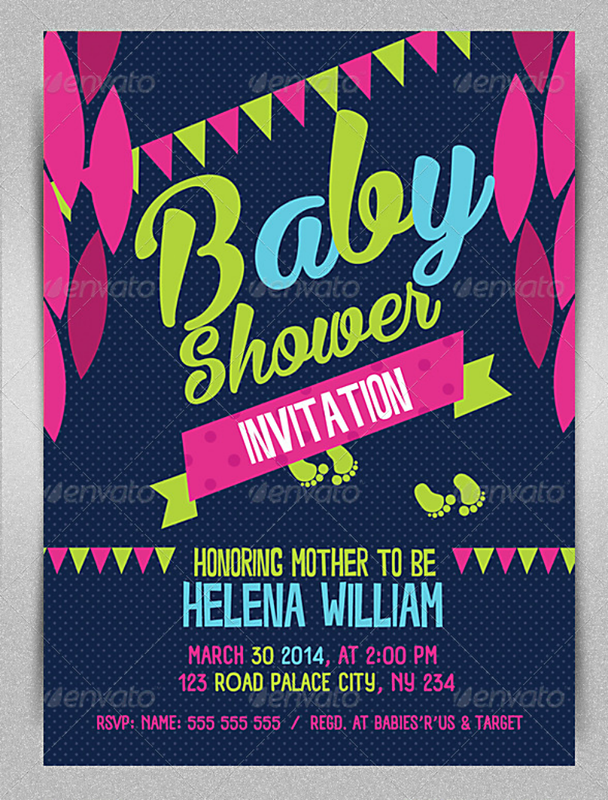 Have fun with this colorful baby shower invitation design. 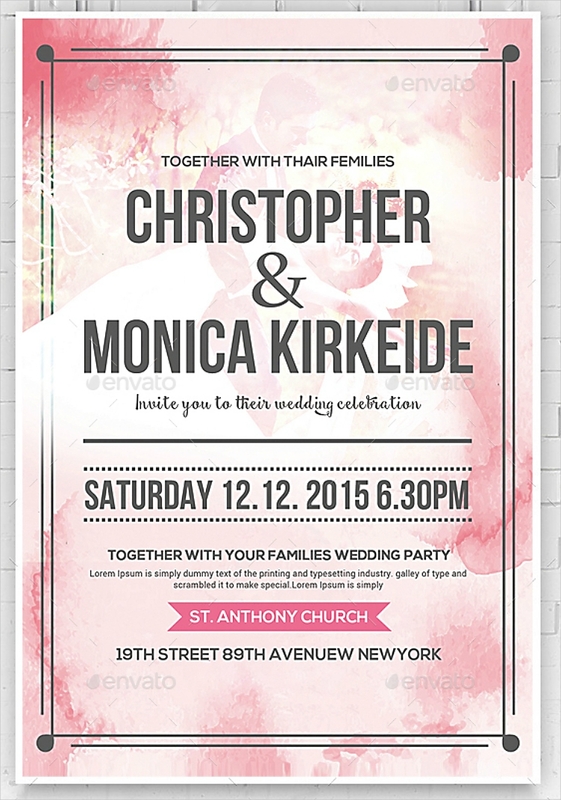 Back to weddings, here is another wedding invitation design that leans heavily toward simplicity. It doesn’t entirely mean that just because a design is simple, it is also cheap or low in quality. Sometimes, or even most of the time, simplicity is the key to quality, and that having less features are much more appealing than those with numerous elements. 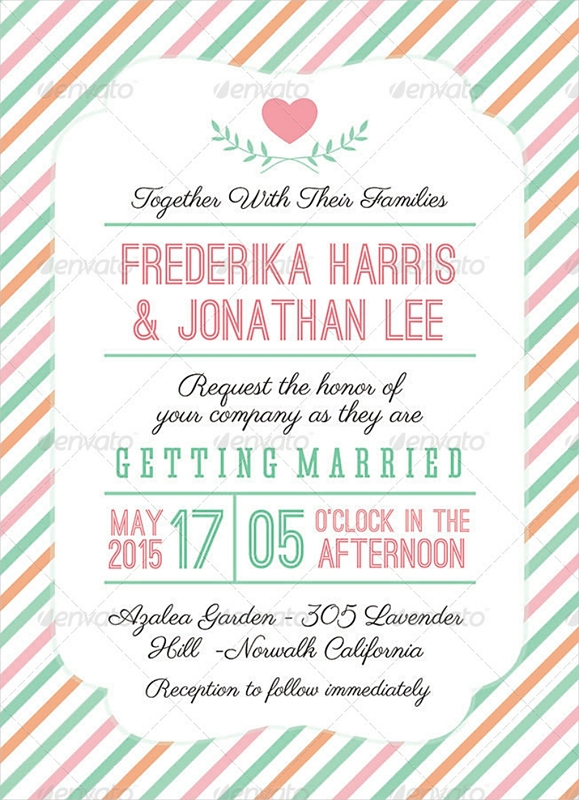 For this design, it focuses on the typography, which provides the details as to the who, when, and where regarding the wedding. 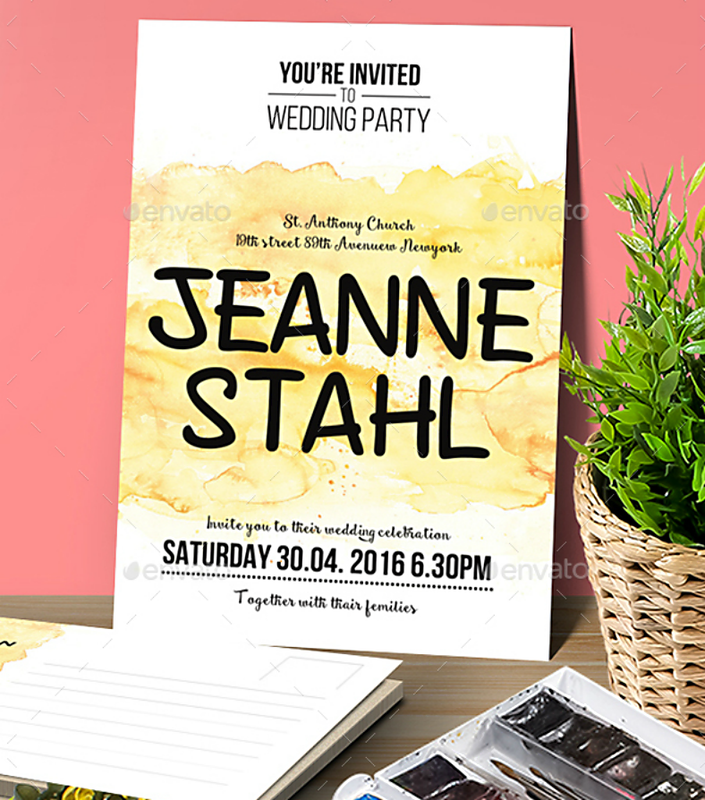 And to prevent the invitation design from looking bland, an abstract art is added on the backdrop. We simply can’t express to you enough how excited we are for this year’s Christmas. Come to think of it, who isn’t excited about Christmas? In some countries, the excitement for the Christmas season already starts on the very first day of September, which is often referred to as the “first of the -ber” months. 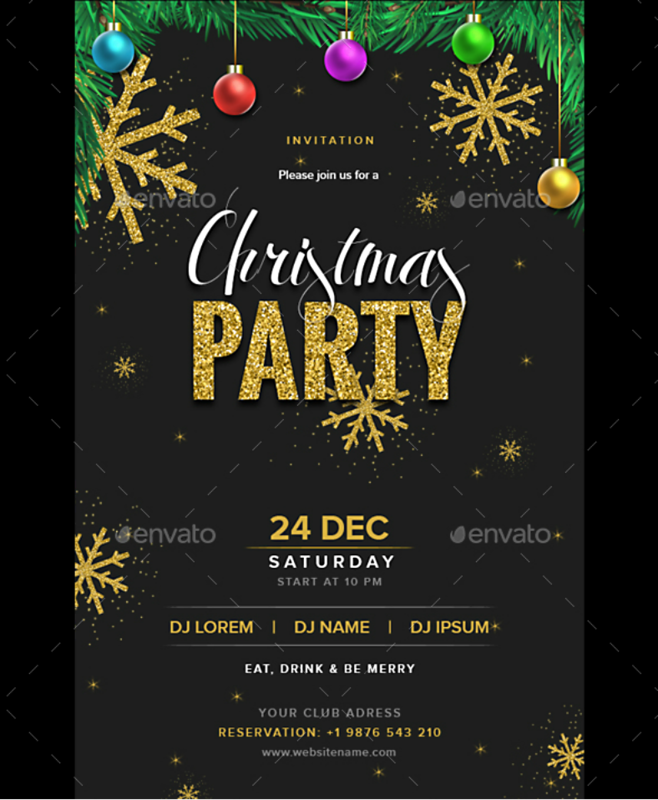 For this Christmas party invitation design, it contains fir leaves and some Christmas balls decorated on the upper-hand portion, and a few golden snowflakes threw into the design for added enhancement. 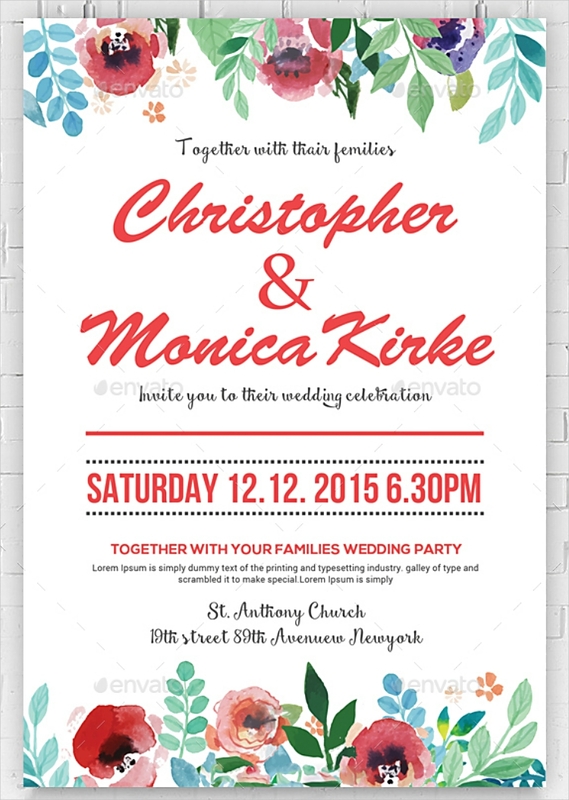 Celebrate your Christmas party with loved ones and the people closest to you by using this design to invite them. Chalkboard designs never get old, regardless of where they are being used. 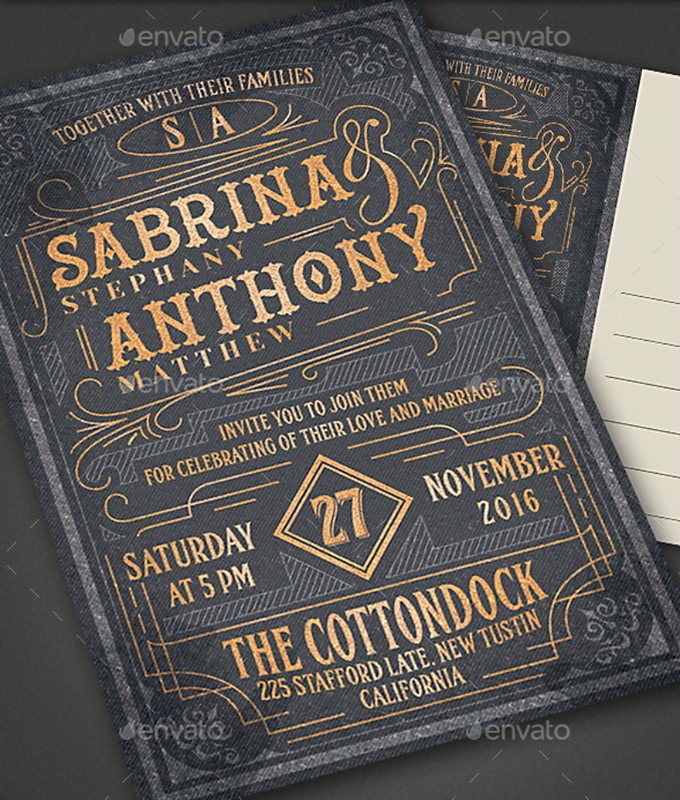 There is really something about chalkboard-inspired designs that make them striking. 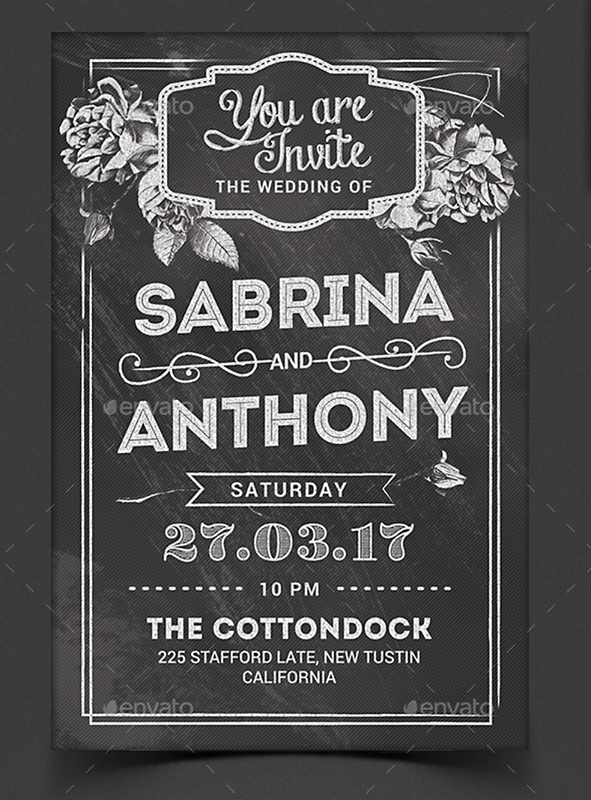 For this wedding invitation design, it utilizes the chalkboard theme that not only makes it appear minimalistic, but it also looks clean and visually appealing. Somehow, chalkboard designs like this remind people of those being used in the circus or those signs seen outside European restaurants. Regardless of the simplicity of chalkboard designs, many still prefer to use it, which only proves how effective they are in capturing people’s attention. Have you ever seen the official posters for famous movies such as The Social Network, Thor, or The Imitation Game? These movie posters simply feature a portrait of the main character with text written over it. 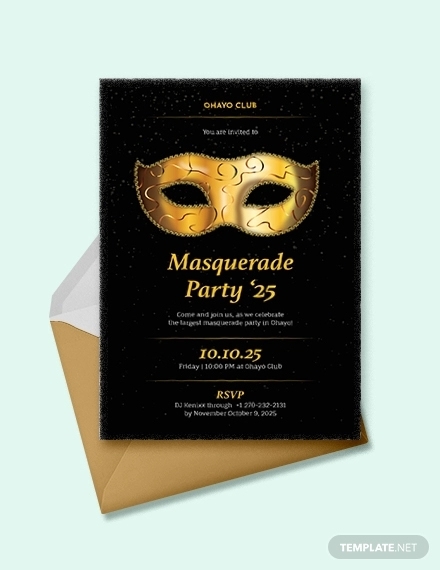 Do you want to use a similar style for your birthday party invitation and make it look like a movie poster? If you do, then you won’t need to stress yourself in looking for a design template because we have it here for you. 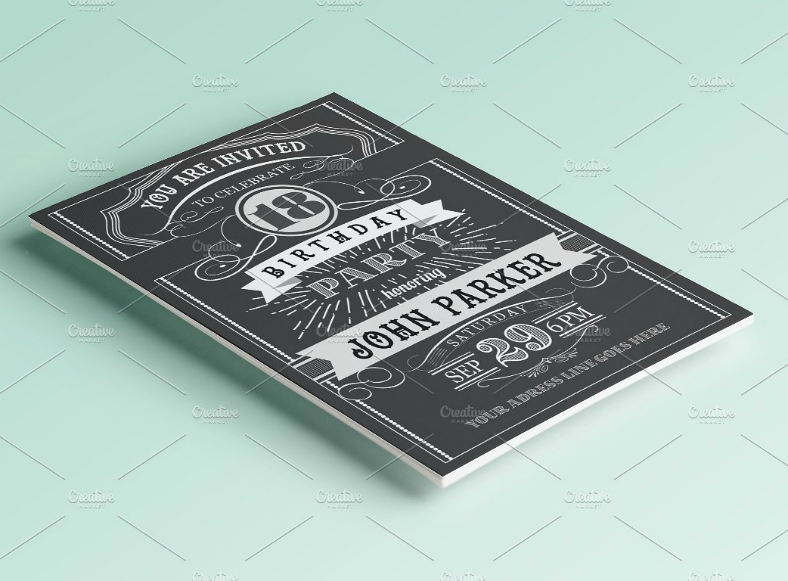 As you can see on the sample image above, the majority of the design involves a portrait image of the birthday celebrant with text written all over it. These texts, if you look closely, are actually the details to the birthday party. 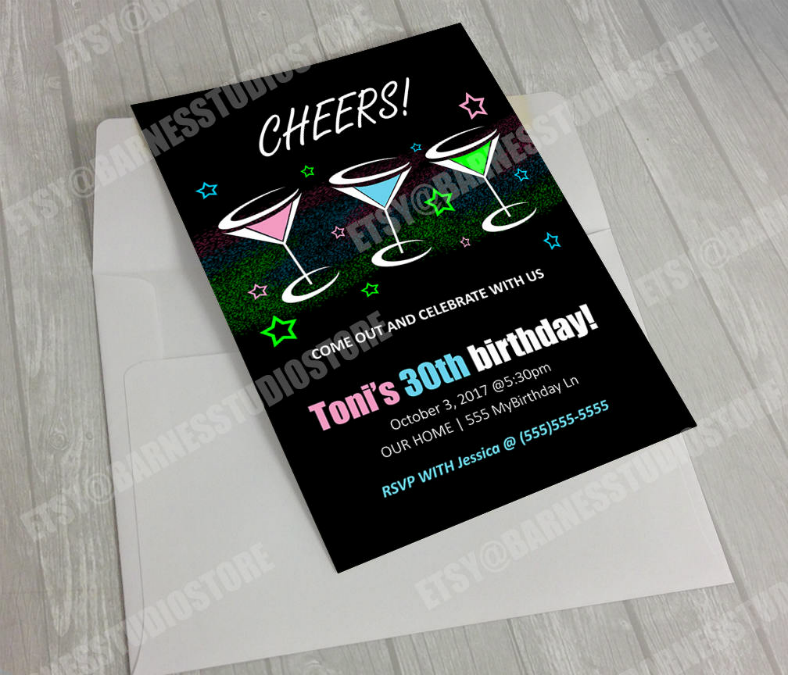 Same as one of the previous designs in this collection, you may be able to change the color hue on this design to something that suits you or your party better. If you have just seen the previous birthday invitation design that we said looked like a movie poster, here is its counterpart which, instead of having the text written around the portrait, it actually has the text written over the portrait. 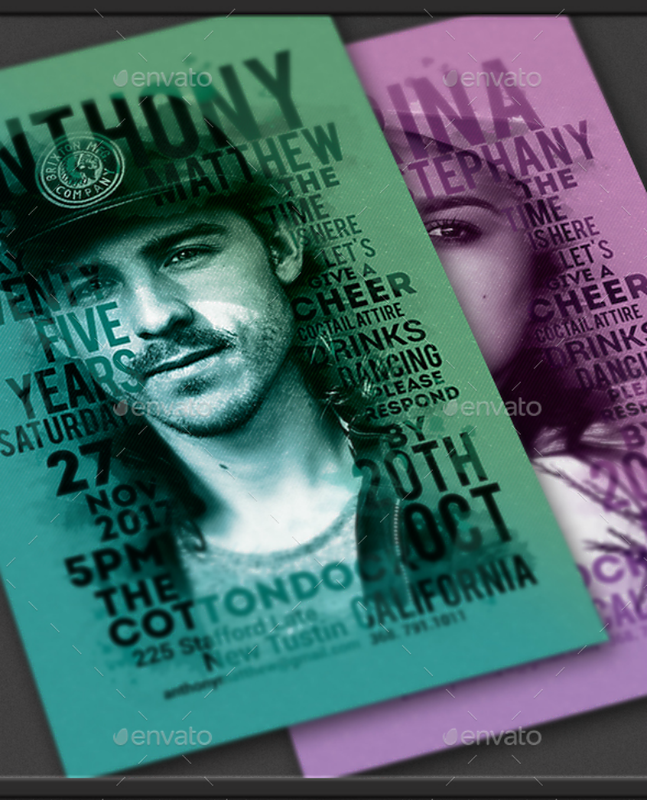 For this invitation design, the text is the primary feature and the portrait image of the birthday celebrant only acts as a supporting element. 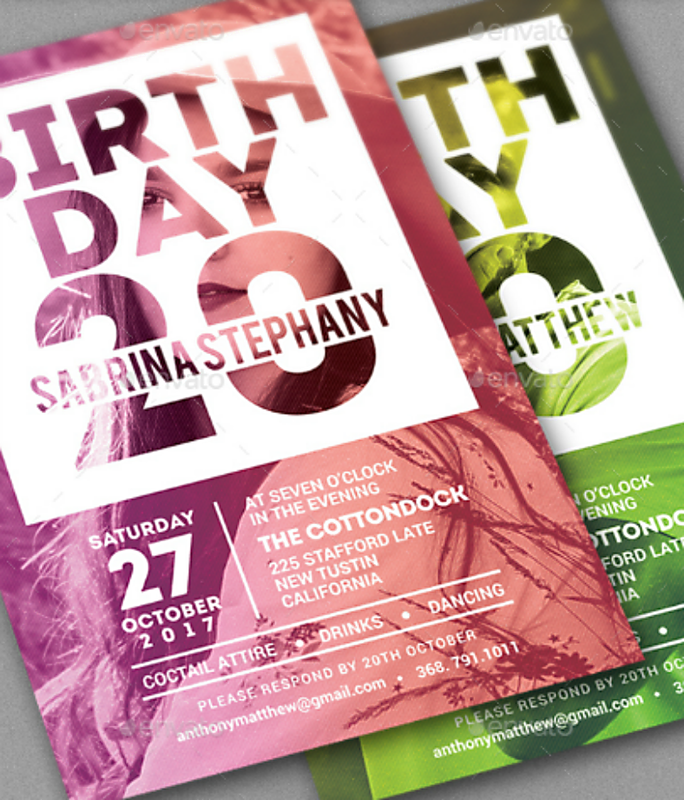 But nevertheless, both elements are able to complement each other and enhance the overall appearance of this birthday invitation design. Just like the previous design, you may be able to change the hue for this one as well. 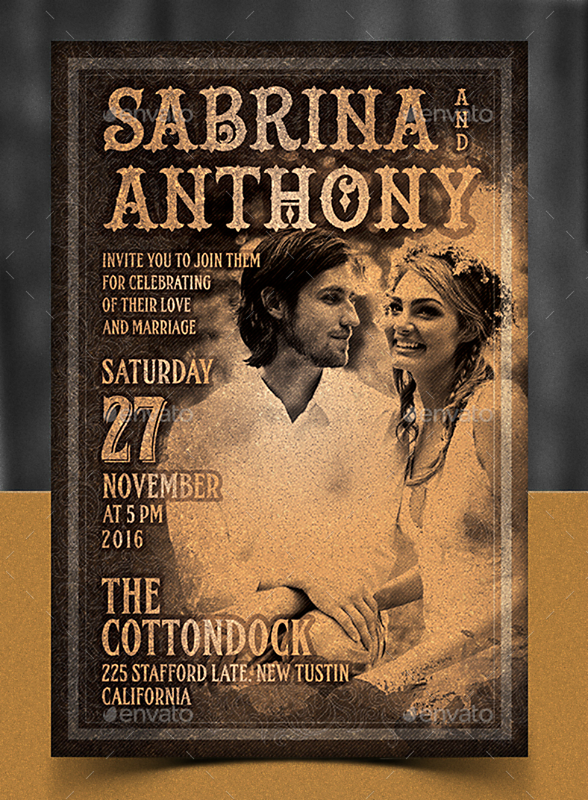 Once again, why go over the top with your marriage invitation design when you can always opt for a cleaner and more organized design? 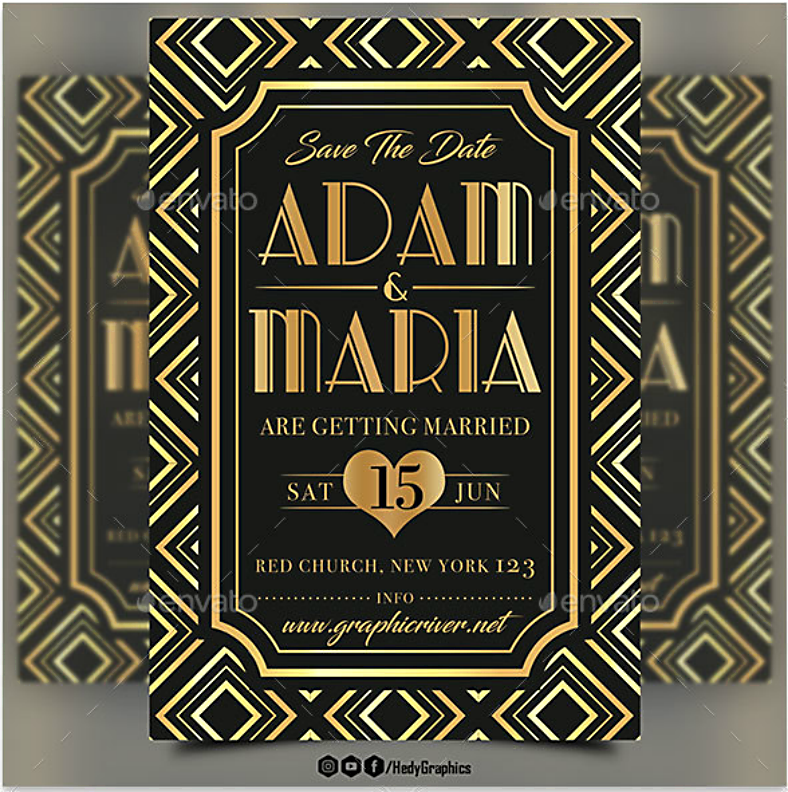 For this design, it lets the readers focus on the more relevant information which includes that names of the couple who will be wedded, the date and venue of the wedding, and other important details that an invitee should know about the event. Both above and below these details are a pattern of dots that are added to help enhance the appearance of the design. Indeed, Christ is the center of Christmas, and it is very well shown in this very beautiful Christmas invitation design. On the upper portion of the design is a pine cone with a pair of fir leaves on its sides and a golden ribbon over it. 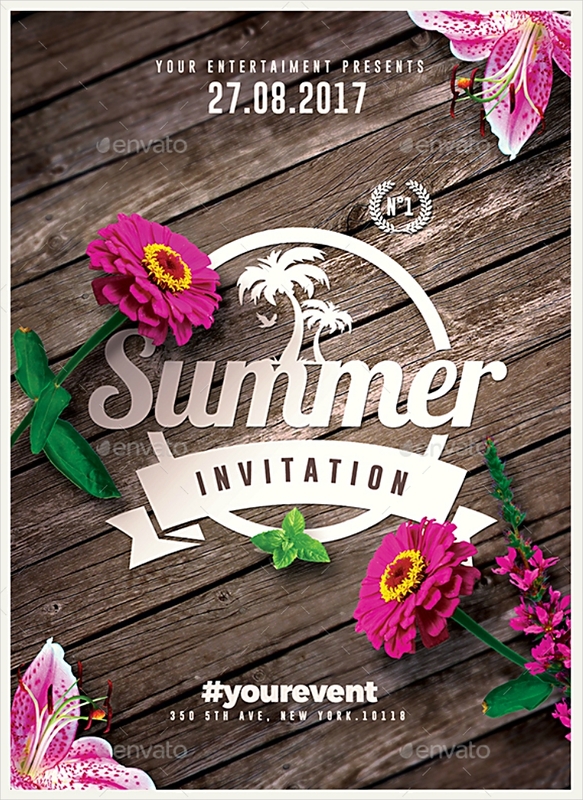 Below this pine cone is the text indicating the purpose of this invitation design, and some supporting details informing the readers with what they need to know about the event. Put Christ in the center of your Christmas, just as this design puts His name right in the center area. 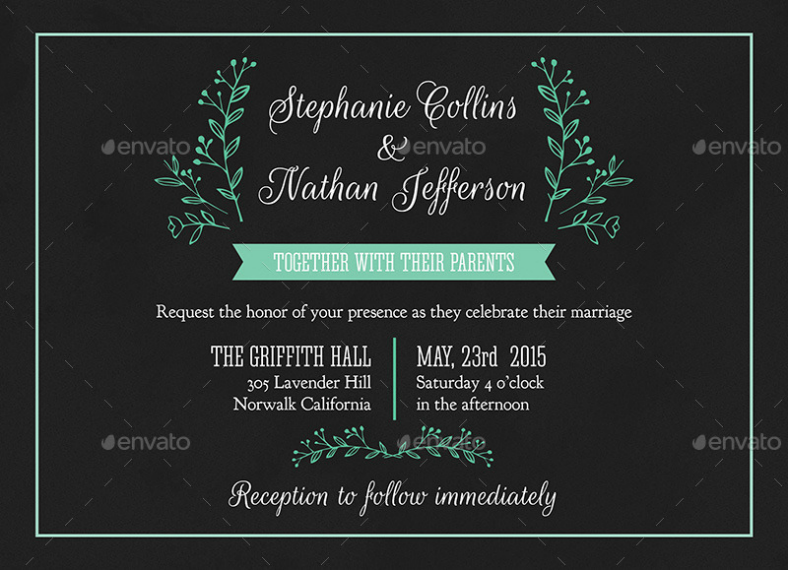 To start concluding this article, may we just say that these PSD invitation designs have been carefully selected from among the best ones all over the Internet and from various reliable websites. To answer the question as to who contributed these designs to the websites, they were created and shared by some of today’s most skillful and imaginative graphic artists from all over the world. These designs don’t just tell you how awesome they are, they actually show you that they are capable of capturing people’s attention by their level of appeal, which makes these designs really worth downloading. For the editability of these designs, as long as you are using the appropriate software such as Adobe Photoshop, GIMP, or even the online editing tool, Photopia, you have nothing to worry since these PSD files are fully and easily editable. There may be even more editing tools that are compatible with PSD files, and they can be easily found using search engines. 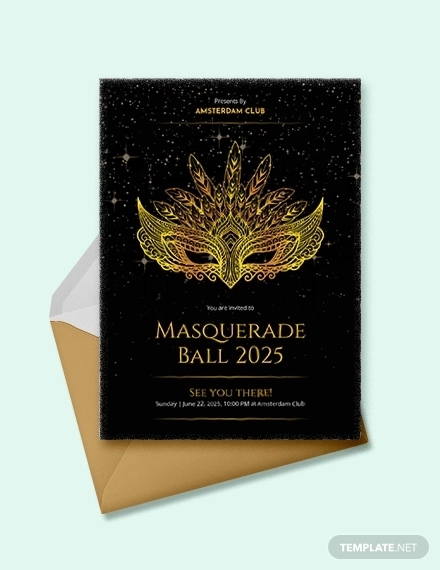 As for the cost of downloading these invitation designs, that won’t be an issue since these don’t really cost a lot to download, you will only need to pay a considerable amount simply to express gratitude to the artists or designers responsible in creating these invitations. 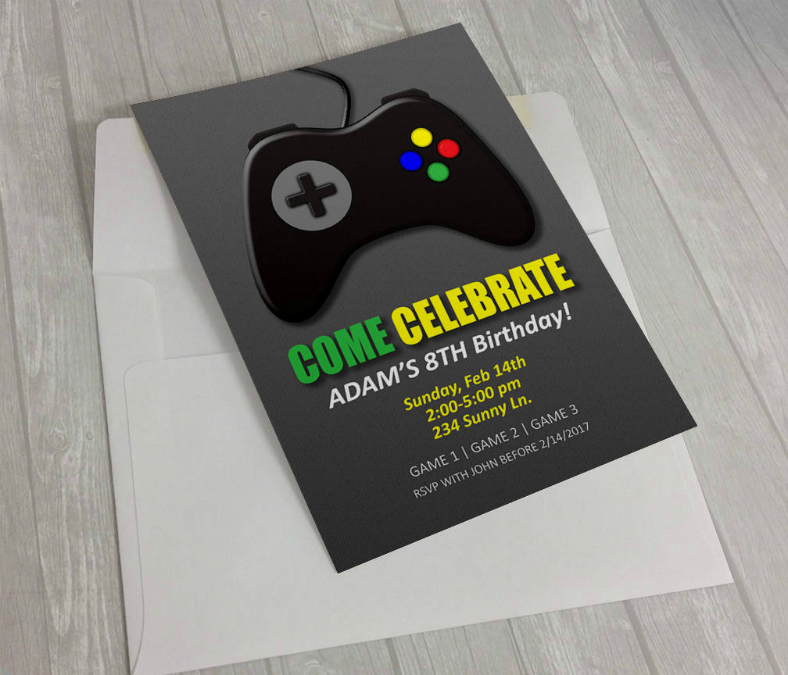 Now that we have done our part in promoting these designs, it’s time for you to learn the steps on how to design invitations, then you can download these PSD designs and use them to make your own event invitations.